As the premier workforce management solution for post-acute healthcare, IntelyCare has the unique opportunity to partner with long-term care administrators. Administrators work tirelessly to ensure that their staff, internal and IntelyPros alike, provides the highest level of quality care to a vulnerable population. Earlier this month we celebrated National Long Term Care Administrator’s Week, which honors the Administrators who lead our nation’s long-term care communities, by awarding IntelyCare’s very first Administrator of the Year Award to Jackie McKenna of Pocopson Home in Chester County, PA. Throughout the past year, Jackie and her team have consistently been ranked as one of the best facilities in the area to work for by our IntelyPros. And this team is no stranger to recognition. 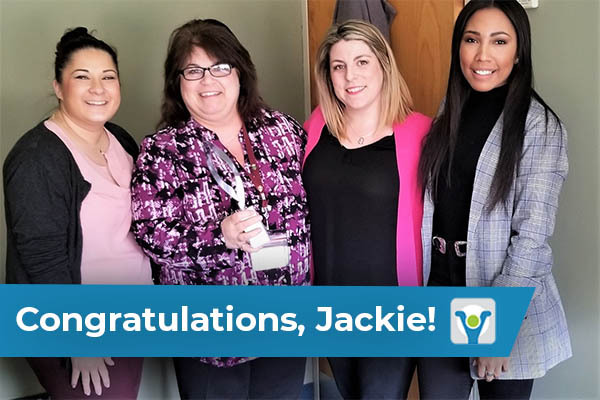 In early January, Jackie and the Pocopson Home team were recognized for their quality of care by the Center for Medicare and Medicaid Services with five stars – the highest rating possible. Pocopson Home is a perfect example of an all-star partnership between IntelyCare and our facilities. On our end, we play an important role in filling some of Pocopson Home’s high priority, last-minute shifts with our IntelyPros, and in turn, we know we are sending IntelyPros to a first-rate facility. Administrators like Jackie McKenna not only care deeply about juggling the many duties involved in running a long-term care facility and meeting the medical needs of its residents; they also strive to build a community that makes residents feel at home. We are ecstatic to honor Jackie with this well-deserved award and to acknowledge the diligent dedication of our many Administrators! Does your facility need help with your staffing needs? Request a demo with a member of our sales team for a walk-through of our intelligent solution. Want to choose your own schedule, earn weekly, and work with amazing facilities like Pocopson Home? IntelyCare provides you with the flexibility to choose when and where you work. Apply today to get started!